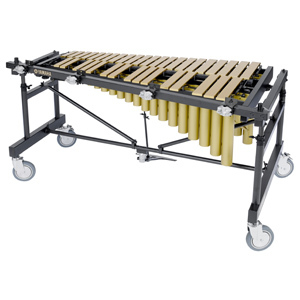 The YVRD-2700 multi-frame vibraphone offers the focused sound of the silver satin finish or gold mirror finish aluminum alloy bars with an exceptionally smooth mechanical operation. A one-piece upper frame and dual crossbars allow transport while set-up - while oversized, swivel pedal and height adjustment encourage player comfort. For a bright, projecting sound, the YVRD-2700 gold intermediate vibraphone uses glossy gold aluminum alloy bars, and features a reinforced field frame. Exclusive Yamaha tuning method ensures true pitch and full sound. The 1 1/2" width and 1/2" thick bars allow projection and full tone while the silver matte finish produces a warm sound. Height-adjustable frame allows all players to find the most comfortable playing position. Oversized swivel pedal allows comfortable pedaling from all positions. The accessory bar has 1 1/2” square pipes to provide a non-slip shape for a clamp to hold added components. Pipes are attached to front and both left and right sides of the system, providing greater freedom in creating an easy-to-use percussion setup. Easy-to-use clamps make set-up and tear down simple. Three sides allow for more mounting locations for accessories, and protect instrument frame. Four RDC-10 clamps included for mounting instruments and accessories to the frame.